Caching rules are available only for Azure CDN Standard from Verizon and Azure CDN Standard from Akamai profiles. For Azure CDN Premium from Verizon profiles, you must use the Azure CDN rules engine in the Manage portal for similar functionality. Global caching rules: You can set one global caching rule for each endpoint in your profile, which affects all requests to the endpoint. The global caching rule overrides any HTTP cache-directive headers, if set. Custom caching rules: You can set one or more custom caching rules for each endpoint in your profile. Custom caching rules match specific paths and file extensions, are processed in order, and override the global caching rule, if set. 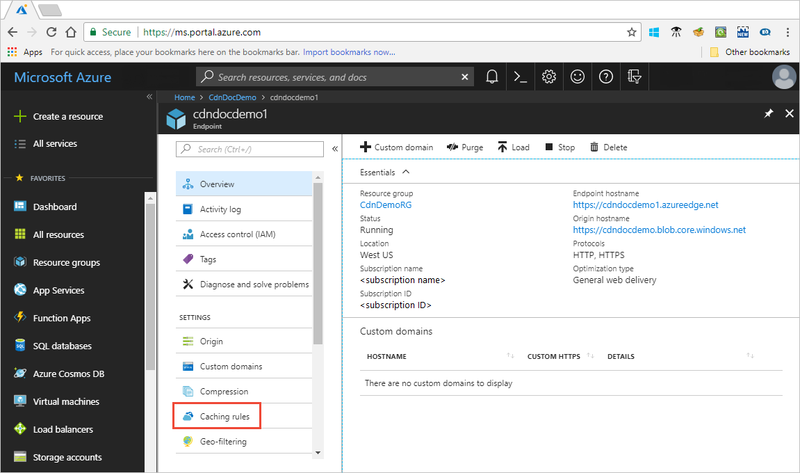 Query string caching: You can adjust how the Azure CDN treats caching for requests with query strings. For information, see Control Azure CDN caching behavior with query strings. If the file is not cacheable, the query string caching setting has no effect, based on caching rules and CDN default behaviors. For information about default caching behavior and caching directive headers, see How caching works. Open the Azure portal, select a CDN profile, then select an endpoint. 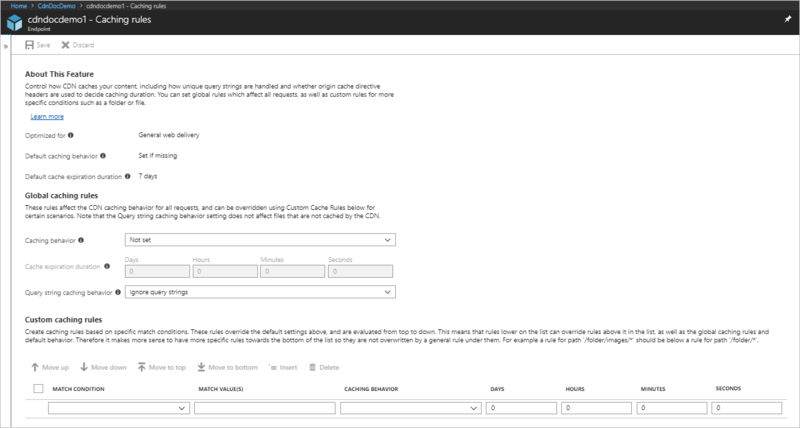 In the left pane under Settings, select Caching rules. The Caching rules page appears. Bypass cache: Do not cache and ignore origin-provided cache-directive headers. Override: Ignore origin-provided cache duration; use the provided cache duration instead. This will not override cache-control: no-cache. Set if missing: Honor origin-provided cache-directive headers, if they exist; otherwise, use the provided cache duration. For the Override and Set if missing Caching behavior settings, valid cache durations range between 0 seconds and 366 days. For a value of 0 seconds, the CDN caches the content, but must revalidate each request with the origin server. For the Bypass cache setting, the cache duration is automatically set to 0 seconds and cannot be changed. Path: This condition matches the path of the URL, excluding the domain name, and supports the wildcard symbol (*). For example, /myfile.html, /my/folder/*, and /my/images/*.jpg. The maximum length is 260 characters. Extension: This condition matches the file extension of the requested file. You can provide a list of comma-separated file extensions to match. For example, .jpg, .mp3, or .png. The maximum number of extensions is 50 and the maximum number of characters per extension is 16. Global caching rules take precedence over the default CDN caching behavior (HTTP cache-directive header settings). Custom caching rules take precedence over global caching rules, where they apply. Custom caching rules are processed in order from top to bottom. That is, if a request matches both conditions, rules at the bottom of the list take precedence over rules at the top of the list. Therefore, you should place more specific rules lower in the list. When these rules are set, a request for <endpoint hostname>.azureedge.net/home/index.html triggers custom caching rule #2, which is set to: Set if missing and 3 days. Therefore, if the index.html file has Cache-Control or Expires HTTP headers, they are honored; otherwise, if these headers are not set, the file is cached for 3 days. Files that are cached before a rule change maintain their origin cache duration setting. To reset their cache durations, you must purge the file. For Azure CDN Standard from Akamai profiles, propagation usually completes within one minute. For Azure CDN Standard from Verizon profiles, propagation usually completes in 10 minutes.